One of the first data structures we studied in this course was the linked list, which consisted of a set of nodes connected in sequence. Then, we looked at trees, which were a generalized version of linked lists. We can consider a tree as a linked list if we relaxed the constraint that a node could only have one child. Now, we’ll look at a generalization of a tree, called a graph. We can consider a graph as a tree if we relaxed the constraint that we can’t have cycles. Notice the hierarchical structure is broken. Is descendent from or is descendent from ? This is no longer a tree, but it is still a graph! Now, node E looks like it is descendent from two nodes. Again, this is no longer a tree but it is a graph. Graphs are a good way to represent relationships between objects. First, let’s go over some terminology. A node in a graph is called a vertex. Vertices usually represent the objects in our graph (the things that have the relationships such as people, places, or things). A relationship between two vertices is represented by an edge. Road maps are a great example of graphs. Each city is a vertex, and the edges that connect these vertices are the roads and freeways that connect the cities. An abstract example of what such a graph would look like can be found here. For a more local example, each building on the Berkeley campus can be thought of as a vertex, and the paths that connect those buildings would be the edges. Computer networks are also graphs. In this case, computers and other network machinery (like routers and switches) are the vertices, and the edges are the network cables. For a wireless network, an edge is an established connection between a single computer and a single wireless router. But not all edges in graphs are the same. Sometimes the relationships between two vertices only go in one direction. Such a relationship can be represented with a directed graph. An example of this could be a city map, where the edges are sometimes one-way streets between locations. A two-way street would have to be represented as two edges, one of them going from location to location , and the other from location to location . Visually, an undirected graph will not have arrow heads on its edges because the edge connects the vertices in both directions. A directed graph will have arrow heads on its edges that point in the direction the edge is going. An example of a directed graph appears below. Every undirected graph is a directed graph, but the converse is not true. Now that we have the basics of what a graph is, here are a few more terms that might come in handy while discussing graphs. Adjacent A vertex u is adjacent to a vertex v if u has an edge connecting to v.
Connected A graph is connected if every vertex has a path to all other vertices. Neighbor A vertex u is a neighbor of a vertex v if they are adjacent. Indegree A vertex v’s indegree is the number of vertices u that have an edge (u, v). Path A path is a sequence of edges from one vertex to another where no edge or vertex is repeated. Cycle A cycle is a path that ends at the same vertex where it originally started. For the following questions, discuss your solution with your partner and submit your answer to the Gradescope assessment. Suppose that is a directed graph with vertices. What’s the maximum number of edges that can have? Assume that a vertex cannot have an edge pointing to itself, and that for each vertex and , there is at most one edge . Now suppose the same graph in the above question is an undirected graph. Again assume that no vertex is adjacent to itself, and at most one edge connects any pair of vertices. 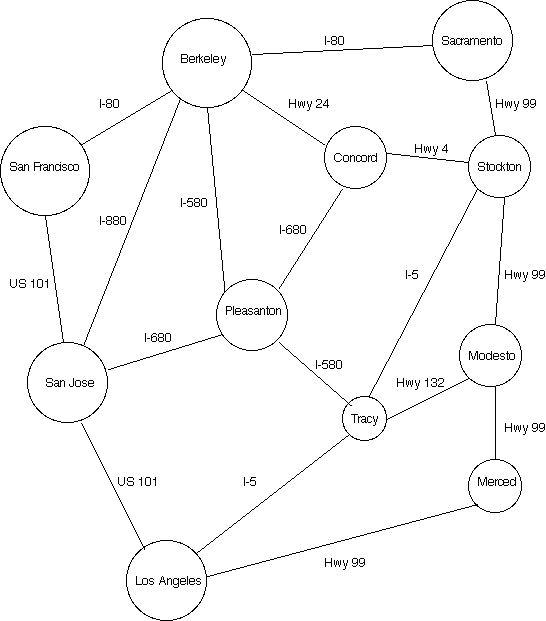 What’s the maximum number of edges that can have compared to the directed graph of ? What’s the minimum number of edges that a connected undirected graph with N vertices can have? Are given vertices u and v adjacent? Is vertex v incident to a particular edge e? What vertices are adjacent to v? What edges are incident to v? Most of today’s lab will involve thinking about how fast and how efficient each of these operations is using different representations of a graph. One data structure we could use to implement this graph is called an array of adjacency lists. In such a data structure, an array is created that has the same size as the number of vertices in the graph. Each position in the array represents one of the vertices in the graph. Each of these positions point to a list. These lists are called adjacency lists, as each element in the list represents a neighbor of the vertex. Another data structure we could use to represent the edges in a graph is called an adjacency matrix. In this data structure, we have a two dimensional array of size (where is the number of vertices) which contains boolean values. The (i, j)th entry of this matrix is true when there is an edge from i to j and false when no edge exists. Thus, each vertex has a row and a column in the matrix, and the value in that table says true or false whether or not that edge exists. What will this matrix will look like for an undirected graph? Discuss with your partner. Considering drawing out the matrix and trying to notice some patterns. A third data structure we could use to represent a graph is simply an extension of the linked nodes idea. We can create a Vertex object for each vertex in the graph, and each of Vertex will contain pointers to the Vertex objects of their neighbors. This may seem like the most straightforward approach: aren’t the adjacency list and adjacency matrix roundabout in comparison? Discuss with your partner reasons for why the adjacency list or adjacency matrix might be preferred for a graph. Additionally, we could also represent a tree using an adjacency matrix or list. Discuss with your partner reasons for why an adjacency list or adjacency matrix might not be preferred for a tree. Now, which is more efficient: an adjacency matrix or an array of adjacency lists? Deciding how to store data is all about trade-offs. The following exercises focus on the big picture of which representation is more efficient in a given situation. The rest of the lab focuses on exactly how efficient things are. For the following exercises, discuss your solution with your partner and submit your answers to the Gradescope assessment. Which is most space-efficient if you have a lot of edges in your graph? Which is most space-efficient if you have very few edges in your graph? Which is most time-efficient for adding an edge if you have a lot of edges in your graph? Which is most time-efficient for adding an edge if you have very few edges in your graph? Which is most TIME efficient for returning a list of edges from one node if you have very few edges in your graph? Which is most time-efficient for returning a list of edges from one node if you have a lot of edges in your graph? Suppose we are representing a graph with vertices and edges. There are booleans stored in an adjacency matrix, so the memory required to store an adjacency matrix is times the memory required to store a boolean value. Assume that references and integers each use 1 unit of memory. The amount of memory required to represent the graph as an array of adjacency lists is proportional to what? Discuss your solution with your partner and submit your answer to the Gradescope assessment. We have given you framework code for a class Graph. It implements a graph of integers using adjacency lists. The code above processes the tree’s values in depth-first order. If we wanted a breadth-first traversal of a tree, we’d replace the Stack with a queue such as a LinkedList. Now, how would we modify this algorithm to traverse a graph? However, this doesn’t quite work. Unlike trees, a graph may contain a cycle of vertices and as a result, the code will loop infinitely. Note that the choice of data structure for the fringe can change. As with tree traversal, we can visit vertices in depth-first or breadth-first order merely by choosing a stack or a queue to represent the fringe. Typically though, because graphs are usually interconnected, the ordering of vertices can be scrambled up quite a bit. Thus, we don’t worry too much about using a depth-first or a breadth-first traversal. Instead, in the next lab session we will see applications that use a priority queue to implement something more like best-first traversal. Note for the Exercises: Instead of checking that the popped vertex v is not yet visited, you can do this check before adding some neighbor to the fringe as well! This would look something like !visited.contains(neighbor). Although it is convention to check that the popped vertex is not yet visited, you may find this alternative way easier to code when you do the DFSIterator exercise later in the lab. Use the graph traversal pseudocode from above to answer the following questions. It might help you to print out copies of the graph here. Now, figure out the order in which the nodes are visited if you start at different vertices. You can check your answers for starting at vertices 1 - 5 below. For this problem assume that we add the vertex’s unvisited edges to the stack in the order higher number to lower number. Here are the solutions for nodes 1-5 (just practice these until you feel comfortable). Complete the DFSIterator inner class. As its name suggests, it should iterate through all of the vertices in the graph in DFS order, starting from a vertex that is passed in as an argument. Note: This iterator may not print out all the vertices in the graph if they are unreachable from the starting vertex, and that’s okay! Additionally, you may use the generateGX methods to generate some sample Graphs to test your implementation for this method (and the following methods)! If you’re having trouble passing the autograder tests for the DFS traversals, think about the effect of duplicate values in the fringe on your iterator. Try constructing a complete graph, and testing your DFSIterator on that! Complete the method pathExists in Graph.java, which returns whether or not any path exists that goes from start to stop. Remember that a path is any set of edges that exists which you can follow that such you travel from one vertex to another. In addition, paths may not visit an edge or a vertex more than once. You may find it helpful for your method to call the dfs method, which uses the DFSIterator class that we just wrote. Now you will actually find a path from one vertex to another if it exists. Write code in the body of the method named path that, given a start vertex and a stop vertex, returns a list of the vertices that lie on the path from start to stop. If no such path exists, you should return an empty list. Hint: Base your method on dfs, with the following differences. First, add code to stop calling next when you encounter the finish vertex. Then, trace back from the finish vertex to the start, by first finding a visited vertex u for which (u, finish) is an edge, then a vertex v visited earlier than u for which (v, u) is an edge, and so on, finally finding a vertex w for which (start, w) is an edge (isAdjacent may be useful here!). Collecting all these vertices in the correct sequence produces the desired path. We recommend that you try this by hand with a graph or two to see that it works. A topological sort (sometimes also called a linearization) of a graph is a ordering of the vertices such that if there was a directed path from vertex v to vertex w in the graph, then v precedes w in the ordering. This only works on directed, acyclic graphs, and they are commonly referred to by their acronym: DAG. Another way to think about it is that the vertices in a DAG represent a bunch of tasks you need to complete on a to-do list. Some of those tasks cannot be completed until others are done. For example, when getting dressed in the morning, you may need to put on shoes and socks, but you can’t just do them in any order. The socks must be put on before the shoes. Thus, a topological sort of your morning routine must have socks appear first before shoes. The edges in the DAG represent dependencies between the tasks. In this example above, that would mean that task A must be completed before tasks C and D, task B must be completed before tasks D and E, E before G, C and D before F, and finally F and G before H. A topological sort gives you an order in which you can do the tasks (it puts the tasks in a linear order). Informally, topological sort returns a sequence of the vertices in the graph that doesn’t violate the dependencies between any two vertices. Why can we only perform topological sorts on DAG’s? Think about the two properties of DAG’s and how that relates with our “to-do list” analogy. Discuss your thoughts with your partner. The algorithm for taking a graph and finding a topological sort uses an array named currentInDegree with one element per vertex. currentInDegree[v] is initialized with the in-degree of each vertex v.
The algorithm also uses a fringe. The fringe is initialized with all vertices whose in-degree is 0. When a vertex is popped off the fringe and added to a results list, the currentInDegree value of its neighbors are reduced by 1. Then the fringe is updated again with vertices whose in-degree is now 0. Implement the TopologicalIterator class so that it successively returns vertices in topological order as described above. The TopologicalIterator class will resemble the DFSIterator class, except that it will use a currentInDegree array as described above, and instead of pushing unvisited vertices on the stack, it will push only vertices whose in-degree is 0. Try to walk through this algorithm, where you successively process vertices with in-degrees of 0, on our DAG example above.